Since moving to the Island, we get to do a lot of Skype dates with our couples who live all over BC, so that we can keep in touch "face-to-face". We officially met Kim and Chris this way as well! We chatted for a while and fell in love with their dynamic together, their charisma, their senses of humour and out-going personalities. We knew they'd be a great fit! 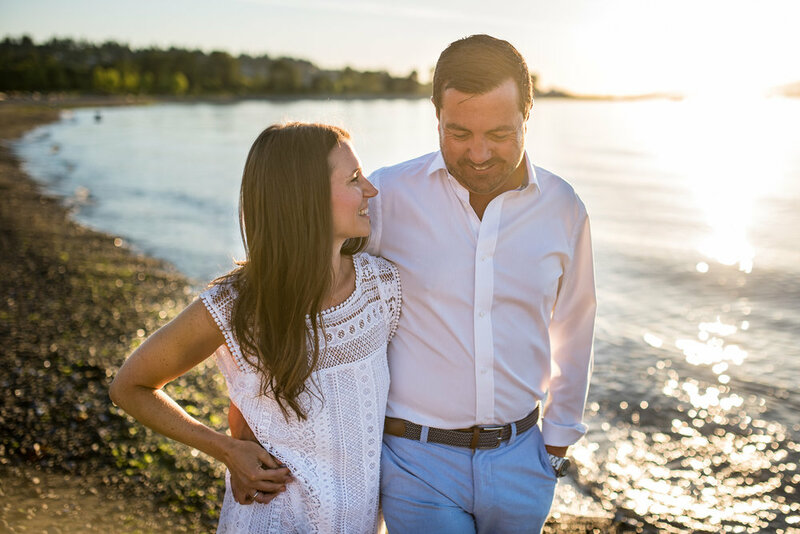 They told us about their friends, family, their hobbies and how they met, and talked about their excitement for their up-coming Hastings House wedding on Salt Spring Island. The very place Kim's parents wed. We especially loved their story of Chris' romantic vision for proposing to Kim, who unknowingly kept foiling his grand plans. This happens more often than you think, and always leaves couples with an interesting and endearing story as a result. Since Chris had planned to propose to Kim on the pier of the Royal Vancouver Yacht Club, and the two spend so much of their time together there, we all thought it'd be the perfect place to do their engagement photos. We spent a warm and summery evening in the park, on the beach, and ended with a gorgeous sunset looking over downtown! Thanks for being such fun and silly subjects for us, Kim and Chris! We hope you love the photos! We're looking forward to your wedding.